Iranian nuclear power. Interior of the reactor containment building of the Bushehr nuclear power plant in Iran. Hanging from the ceiling is a fuel rod assembly. 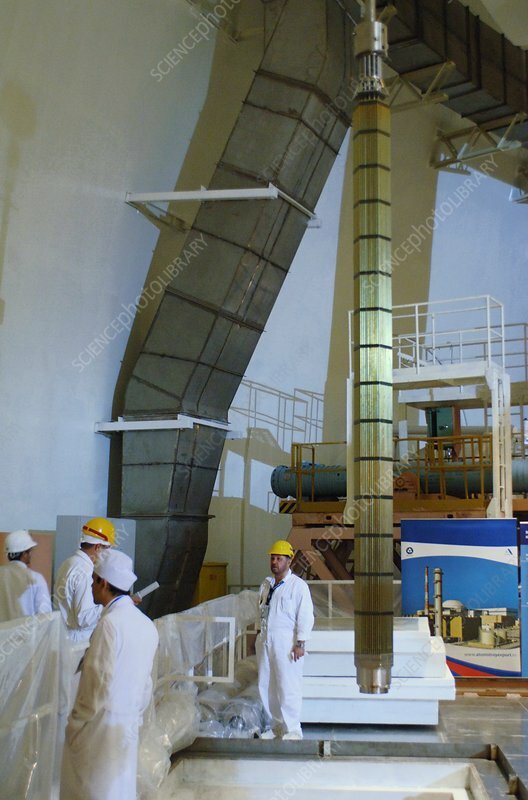 Bushehr is a 1000 MW (mega watt) VVER1000/466 pressurised water reactor (PWR). Construction started by a German company in 1975 but ended with the Islamist revolution in 1979. In 1995 construction recommenced, this time by Russian engineers. By 2012 the reactor was reported as running at 75 per cent of full power. Two further reactors of the same type are planned for the site. Some commentators are concerned that poor engineering standards may have been used and that the reactor might be unsafe. Photographed in 2010.